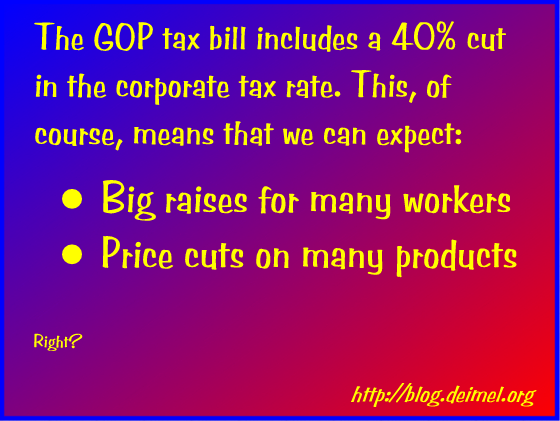 It seems likely that, contrary to all reasonable calculus, the Congress will pass the regressive Republican tax “reform” bill tonight or tomorrow. The cynical interpretation of this is that our legislature is driven completely by self-interest—by the desire to satisfy their donor clients on one hand, and the siren-call of personal financial self-interest, on the other. The most generous interpretation is that our Senators and Representatives are clueless. What GOP legislators have been saying in interviews is that (1) the tax code is being simplified, (2) the middle class will get a big tax cut, (3) corporations will get a big tax cut, and (4) corporations will repatriate money stashed abroad. Although Republicans mostly avoid saying it, the party has an unshakable, but empirically unsupportable, faith—“belief” is surely the wrong word—in trickle-down economics. Republicans repeatedly tell us that the tax bill will grow the economy, but they fail to explain by what magical process this is supposed to happen. Never have the benefits of reduced taxes really trickled down to those who most need a break. But, of course, history may come out differently this time. Apparently, large corporations, newly flushed with money, are supposed to invest in new plant, hire more workers, and slash prices, all leading to economic growth and universal happiness.